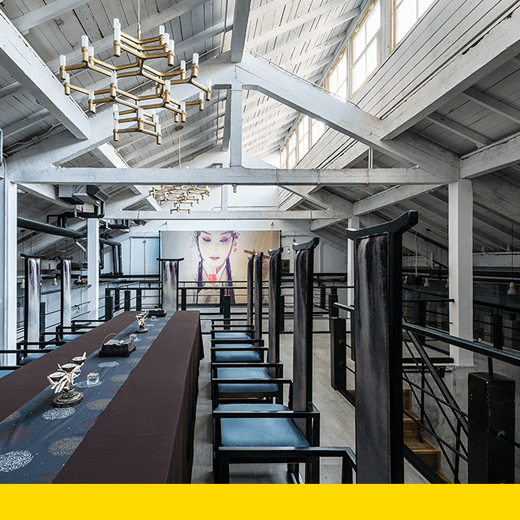 This project, the Museum of International Brewmasters Art, located in the center of Beijing, occupies an old Russian-style industrial building. The museum is intended to energize and promote Chinese wine culture. The creation of wine is the fruit of the wisdom of our ancestors and the combination of soil, water, fire, grain and other elements with the time required to brew an exciting wine. The design of the building was inspired by the natural wine-making process, matching the spatial patterns formed by soil, water, fire, and grain to produce functional spaces with different spiritual meanings. The large metal grille wall added to the front of the building embodies the spirit of an old winery reshaped by contemporary design techniques. Sunlight penetrates the grille to illuminate the aged factory building in rear to create more interactive spaces between wine and people.